HONOLULU – The Hawaii Department of Transportation (HDOT) advises Oahu motorists that construction on a Lumiaina Street traffic improvements project will begin Monday, Jan. 5, between Lumiauau Street and Kamehameha Highway in Waikele. The project will add a dedicated left-turn lane on Lumiaina Street in the eastbound direction, turning onto the northbound lanes of Kamehameha Highway towards Mililani. Traffic signals will be modified to provide a left-turn green arrow for these lanes. Work will be scheduled on Mondays through Fridays from 8:30 a.m. to 3 p.m., daily, excluding holidays. Construction will begin on Monday, Jan. 5, with preparation work for the removal of the existing median to create space for the new turn lane. The left eastbound lane will be closed during work hours between Lumiauau Street and Kamehameha Highway, but traffic across and onto Kamehameha Highway will still be allowed. The project is anticipated to last six months with completion in June of 2015 at an approximate cost of $826,000. The HDOT urges drivers to allow for extra travel time and to drive slowly and safely through the work zone area. 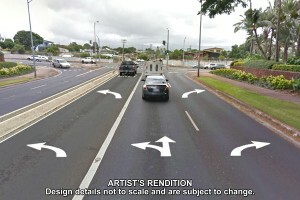 Upon completion, the new left-turn lane on Lumiaina St. will allow two lanes to turn onto Kamehameha Hwy. towards Mililani instead of only one, as seen in this artist’s rendition. Traffic signals will be modified to allow for the left-turn movement.